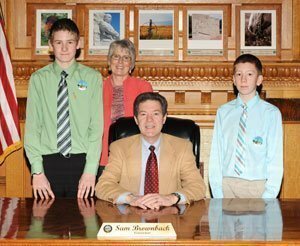 Kansas Speaker Pro Tem Peggy Mast hosted two legislative pages from Osage City, Jarett Combes and Dalton Shaffer, on March 5, 2014. The students enjoyed a pizza lunch in the Speaker Pro Tem Conference Room, and observed the House proceedings. They then took a tour of the freshly renovated Capitol which included a tour of the dome. In photo, from left, are Jarrett Combes, Kansas Speaker Pro Tem Peggy Mast, Gov. Sam Brownback and Dalton Shaffer.